We are very pleased to announce the landing of the some of the world’s highest quality, and most celebrated, Belgian pralines at our store in Toronto. These works of art, are hand-made by a rising star in the chocolate world, David Maenhaut, founder of Chocolatier M.
David Maenhout, Master Chocolatier, and Belgium’s “Chocolate Ambassador”. 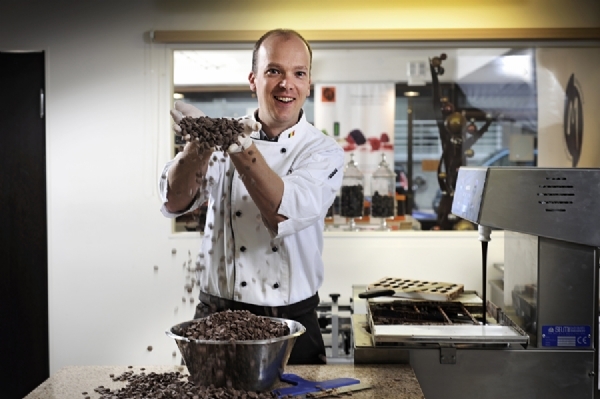 Founder of Chocolatier M, Knokke, Belgium. Voted “Top Chocolatier of Belgium” by Gault & Millau, 2013. Pleasing to all of the senses, each piece is visually stunning, adding to the experience of the bold flavours and textures inside. But you don’t have to take our word for it, foodEpedia refers to Meinhout’s work as “chocolate heaven”, and acclaim from connoisseurs and happy customers continues to roll in from around the world. At De Meersman in Toronto’s Yorkville area, and online across Canada, we are pleased to make an exclusive collection available to you, selected personally by David Maenhout. In the coming years, we hope that you enjoy these fine chocolates as much as we do.